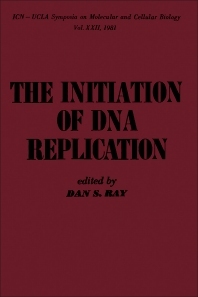 The Initiation of DNA Replication contains the proceedings of the 1981 ICN-UCLA Symposia on Structure and DNA-Protein Interactions of Replication Origins, held in Salt Lake City, Utah on March 8-13, 1981. The papers explore the initiation of DNA replication and address relevant topics such as whether there are specific protein recognition sites within an origin; how many proteins interact at an origin and whether they interact in a specific temporal sequence; or whether origins can be subdivided into distinct functional domains. The specific biochemical steps in DNA chain initiation and how they are catalyzed are also discussed. This book is organized into six sections and comprised of 41 chapters. The discussion begins by analyzing the replication origin region of the Escherichia coli chromosome and the precise location of the region carrying autonomous replicating function. A genetic map of the replication and incompatibility regions of the resistance plasmids R100 and R1 is described, and several gene products produced in vivo or in vitro from the replication region are considered. The sections that follow focus on the DNA initiation determinants of bacteriophage M13 and of chimeric derivatives carrying foreign replication determinants; suppressor loci in E. coli; and enzymes and proteins involved in initiation of phage and bacterial chromosomes. The final chapters examine the origins of eukaryotic replication. This book will be of interest to scientists, students, and researchers in fields ranging from microbiology and molecular biology to biochemistry, molecular genetics, and physiology.